Laniakea, or "wide sky," is the name of a fresh water spring near the east intersection of Pohakuloa Way and Kamehameha Highway. The spring's waters surface among the rocks on the shore below the beachfront homes, and its location from the 1920s to the 1970s was marked by a sign on the side of one home that said "Laniakea." In November 1955, veteran surfers Pat Curren, Buzzy Trent, Peter Van Dyke, Fred Van Dyke, George Downing, and Wally Froiseth drove up to an unnamed surf site off the west end of the intersection of Pohakuloa Way and Kamehameha Highway. Bud Browne, surfing's first movie producer, was with them. The waves were huge and breaking so far out that Browne started searching for an elevated vantage point for his camera. In the rear of the homes on Pohaku Loa Way he found an old, three-story, steel-frame observation tower that had held an anti-aircraft gun during World War II. He climbed up to the top deck and filmed the guys surfing. After the surf session, the seven of them discussed possible names for the new spot. Browne mentioned that he had seen a sign "Laniakea" on a cottage near the tower he had climbed and suggested they use the name. Everyone agreed. 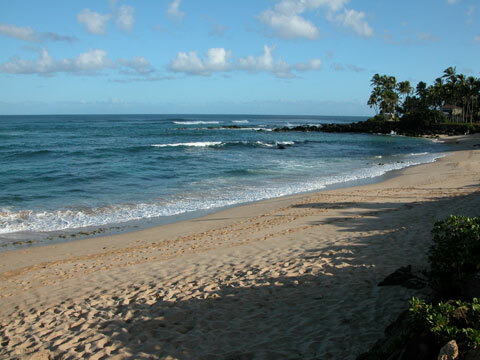 Today, Laniakea is one of the North Shore's famous surf sites. Laniakea Beach Support Park is three acres of undeveloped land owned by the City and County of Honolulu on the inland side of Kamehameha Highway at Laniakea. A sand beach fronts the park, but is lined with a rocky shelf. Seaweed growing on the shelf and the ocean bottom attracts turtles to the beach, many of them coming ashore to rest on the sand near Pohaku Loa Way. During periods of high surf, a powerful rip current runs through the wide channel on the west side of Laniakea. Surfers use the long sand beach fronting the park to reach several surf sites besides Laniakea, including Hultin's and Himalayas.